May not be the right site for this but does anyone have a good site that I can go to for ice conditions for east harbor. Appreciate any help. I'm about 2.5 hours away and would like to give it a try if safe. Thanks. Thanks I'll look it over. Also put post on Facebook and got feedback that it needs a little time yet. Hey Fishhawk, I called Herbs bait & tackle yesterday and the guy told me that there was 6" before the rain. Hoping that all the rain water froze up by now. I am 1.5 hours away and going there tomorrow. I'll let you know what I find. The lake is locking up around PC and Marblehead. There were a few people spudding out of Catawba launch today. Plenty of shantys on East harbor this afternoon. Yesterday afternoon at least a dozen shanty's out at East Harbor. Report was 4 inches of ice. Ohio ice fishing on Facebook... someone posted a video of the ice moving pretty fast at Port Clinton. Anyone have any info on this? We have people coming from KY this weekend and would save them a 6 hour trip if Lake Erie is not fishable. Any help would be great! When I drove into town yesterday morning, the ice had blown out from the gusty SW winds. We only have two and a half days of really cold, but then it's back up to above freezing for Saturday and then mid 50's for Sunday and Monday. I recommend they stay home. Thank you so much Capt Juls! I will let them know today to cancel their hotel room and trip. 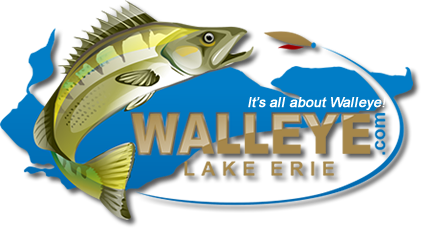 I appreciate everything you do for this site and all the help I have received from you, as I am a rookie at fishing for walleye. I have learned a lot in the past year as this was my first year walleye fishing. I came from tournament fishing for bass, and I converted over to the tasty, succulent meat that the walleye has to offer. Vic's talked me into getting a Ranger 1880MS. It's a start for now and hoping to upgrade in a few years to what you have. I have met a few Captains out there as they were camped at the same campground as us. Everyone is so nice in the walleye fishing community and not selfish to share information. Great group of people out there! Can't wait to get the boat back on the water. Maybe if East Harbor is not broken up by the winds, we will get to fish it this weekend. Love the panfish bite through the ice! From what I've been hearing, you're going to really enjoy that 1880MS! And, I'm sure you will have no issues over there on East Harbor ice fishing. Good luck! Nothing better than a nice mess of bluegills for a fish fry....my favorite!